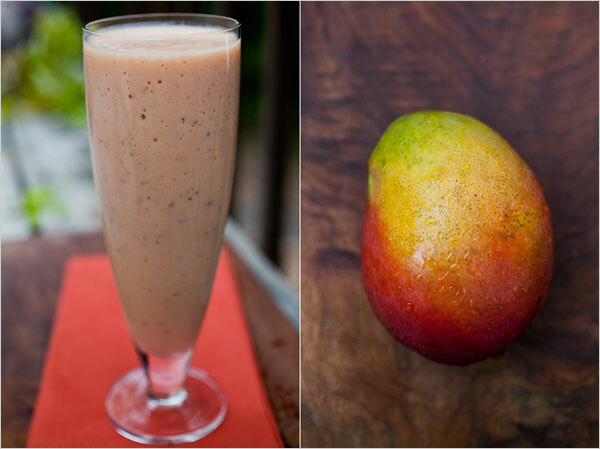 This smoothie has a tropical flavour and a beautiful pale orange colour. Mangos have such a rich character that you may be surprised to find that they are not a particularly high-calorie fruit (one medium mango has about 135 calories, according to Johny Bowden's "The 150 Healthiest Foods on Earth"). That's because they have a relatively high percentage of water, which is why they're so juicy when they're ripe. They're a good source o potassium, vitamin A and beta-carotene. This is inspired by wonderful Indian buttermilk drinks, called lassi. 1. Combine all of the ingredients in a blender, and blend at high speed until smooth.